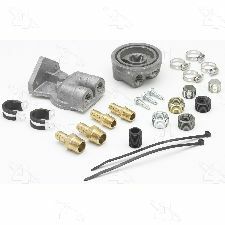 Showing 1 - 4 of 4 Products for Engine Oil Filter Remote Mounting Kit. Oil Filter Relocation Kit. Contains filter mount and engine adapter. Hose not included. Oil Filter Relocation Kit. Contains filter mount and engine adapter. Hose not included. Remote filter kit is optional unless otherwise noted. Some OEM filters will not seal on the oil filter adapter, Use Fram filter number PH8A or equivalent. Oil Filter Relocation Kit. Contains filter mount and engine adapter. Hose not included. No remote oil filter applications for engines with 22MM oil filter thread. 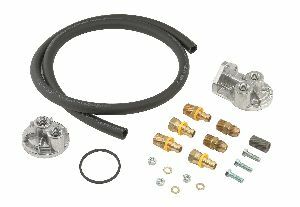 This kit relocates the oil filter for quick, clean and easy access and increased filtering. It is complete with precision die cast aluminum by-pass, filter brackets and all high pressure connectors.